​On 1st April 2014 a new law came into force which requires local authorities to offer more choices in the way social care and support is provided. It is called the Social Care (Self Directed Support) (Scotland) Act 2013. SDS is aimed at helping people to live their lives as independently as possible. As the expert in their own life, individuals should be able to direct their own care money to pay for the services that they think will benefit them the most. The concept is based on choice and control which involves responsibility and personalisation. Option 1 - Direct payment. Option 2 - Direct your available support using a 3rd party. eg: a brokerage service. Option 3 - The local authority arrange support on your behalf. Option 4 - Mix of options. These choices are a way for individuals, with assistance, to work with social work, other organisation, professionals and others with interest, to assemble a care package that suit the individual's needs. Some ways SDS can benefit you. Being supported to live at home. Compiling a personalised support plan. Accessing community life and facilities eg: sports, hobbies, clubs, groups and cafes. Purchasing equipment and adaptions for your home to enable you to live independently. Employing a person as a Personal Assistant. 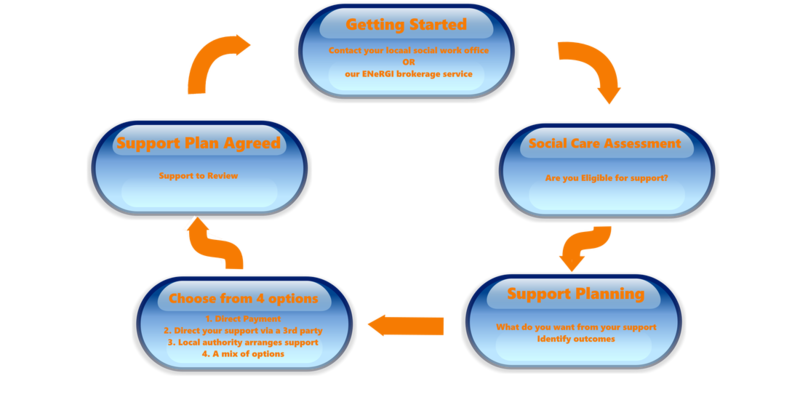 Helping the individual plan, identify and implement informed choices surrounding their support needs and requirements. Keeping an eye on what is happening and reviewing the outcomes. Assistance with all pay, contractual and employment issues including pension enrollment and liaising with HMRC. A Support Broker assists in the coordination and arrangements of the support required to meet an individuals outcomes identified in their support plan. In short support brokerage is about getting what you want using a third party advice and information brokerage service. ​We can signpost you to a Support Brokerage service, that includes information and professional advocacy which is local, accessible and free of charge. You can have the expectation and confidence that the Support Brokers have the knowledge, skills and ability to fully focus on your personal outcomes, providing maximum choice and control without employer responsibilities. We realise the thought of taking on the responsibility as an employer can be daunting so we aim to provide as much information as possible to make your task easier. Please follow this link for more information on employing a personal assistant.